Calla Lily Personal Care Ltd.
Research, development and manufacture of innovative feminine hygiene products including the award-winning Tampliner(R) - the first meaningful new tampon innovation in 80 years. Cascades Tissue Group - IFC Disposables, Inc.
Cascades-IFC Disposables Inc. manufacturers a full line of disposable nonwoven wiping cloth products for the jan/san, industrial, institutional, foodservice, healthcare and automotive markets. IFCs product lines are distributed through out the United States, Canada and abroad. Product lines are known by trademark names such as: North River® Cycle II, WorkPac* 2-ply All-Purpose Wipers, Tuff-Job® Scrim Reinforced, Presto-Wipes® Airlaid, Privilege® Airlaid Dinner Napkins, Like-Rags® Spunlace, Busboy® Foodservice towels, Dusterz® Anti-Static, Grabn Dust™, Golden Dusters™ Cleaning & Dusting cloths and newly introduced Busboy® Surface Sanitizing Wipes and Tuff-Job® Hand Cleaning 3D Textured Towels. Cascades-IFC has built its reputation on supplying innovative products, with focus on providing superior sales support and implementing convenience by offering a wide variety of products along with timely shipments. 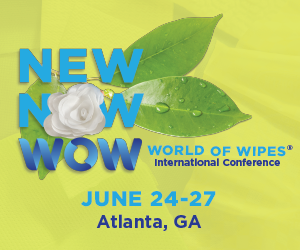 Cascades-IFCs wide range of disposable wiping cloth products provides the distribution market with a complete source of Wiping Solutions® for their customers needs. Chase Machine & Engineering designs, manufactures and services custom equipment to suit our customers' needs at a fair price with on-time delivery. No. 12 East Chang An St.
China Nonwovens & Industrial Textiles Association (CNITA) is an organization approved by the Ministry of Civil Affairs of the People's Republic of China. It is a social intermediary organization which is comprised of enterprises, institutions, and relative associations in the field of nonwovens and technical textiles. Manufacturer of Feedblocks and Dies for extrusion processes. Executive Search Firm that specializes in the Nonwoven Industry placing positions throughout the U.S. |Coley Company places C-Level, VP, Director and Manager level positions. Positions we place include Sales, Marketing, Product Development, Engineering, Manufacturing Management and Supply Chain. We lead searches on a retained or contingency basis. Colquimica is specialized in the production of hot-melt adhesives for the industry. We operate worldwide selling hot-melt adhesives for a wide range of applications for the nonwoven sector, such as absorbent hygiene products, plasters, disposable surgical products, filters, pocket spring and packaging of medical products. Columbu Industries is a leader in Performance Engineered Air Filtration Products. Many of our products are made with media proprietary to us. Columbus Industries Supraloft(R) nonwoven high loft polyester is available in a wide variety of performance levels and thicknesses. Materials are supplied dry or tackafied, with or without antimicrobials and/or activated carbon. Consolidated Fibers is a leader in providing fiber solutions for manufacturers across a range of industries including hygiene, medical, filtration, automotive, furniture, home textiles and more. We have achieved this status over fifty years of successfully focusing on relentless professionalism, unwavering integrity and establishing long-term relationships with our customers. Conversion Technologies International, Inc. is a custom adhesive converter that is dedicated to providing the highest quality service to our customers. We specialize in coatings and laminations of adhesives for a variety of industries. The wide range of equipment at Conversion Technologies Int'l offers many solutions for custom coatings and laminations to a wide range of substrates. We convert "B" grade (waste) fiberglass and polyester mat into other useful products but not into the original industry it was made for. Cotton Incorporated is a not-for-profit company whose mission is to increase the demand for and profitability of cotton. The organization does not make or sell anything. Instead, it is in the business of helping companies around the world and across supply chains understand how cotton can bring value to their businesses. We are responsible for wide-ranging work in research and marketing. Cotton Incorporated is a one-stop resource of information and expertise. Technical consulting relating to touch fasteners and methods of producing them, including the use of ultrasonics. Project management, product development consultancy. In business for over 75 years, Curt G. Joa, Inc. is a world leader in developing, engineering, and manufacturing state-of-the-art machinery for the production of: baby diapers and pull-ups; adult incontinence diapers, pull-ups and related products; feminine hygiene products; medical and wound care products; personal care and home care products; industrial and filtration products; and a variety of other custom nonwoven disposable products. |A well-known strategy for business success requires that you differentiate yourself from your competitors. Joa does so with our advanced manufacturing capabilities, high levels of innovative technology, value added services, strength of reputation and sound financial stability. Joa machines are installed and supported in over 55 countries around the world.